Gresham’s is a historic and vibrant co-educational school, founded in 1555. Our school is set in 200 acres and enviably located between the award-winning coast and countryside of north Norfolk in an Area of Outstanding Natural Beauty, where we are inspired to bring out the best in each other. Our progressive academic curriculum, high quality teaching and excellent facilities support every pupil’s learning journey throughout the school. Classroom learning is complemented by a variety of academic societies and clubs as well as our ever-popular field trips that engender a wider, outward focus. Our Sixth Formers can opt to study A-levels or the widely respected International Baccalaureate Diploma (IB). Gresham’s is the only school in Norfolk to offer the IB, has swiftly gained an international reputation as an IB centre of excellence, with pupils progressing to some of the world’s most prestigious academic institutions. Outside the classroom, pupils enjoy seemingly unlimited opportunities to participate in an exciting range of co-curricular sports, arts and music activities along with adventurous expeditions and community-based service. Whilst we can boast first class academic achievements, the academic success and personal development of all pupils at all levels gives us the greatest sense of fulfilment and reward. A Gresham’s education enables our pupils to develop in a huge variety of areas and we have a tradition of producing outstanding achievers in all walks of life, including architects, diplomats, engineers, musicians, and sports men and women and many more. Old Greshamians have been inspiring others for generations from composer Sir Benjamin Britten and poet W.H. Auden to the founder of the Dyson Company, Sir James Dyson. More recently, Old Greshamians making their mark and creating headlines include international rugby players Tom and Ben Youngs and BAFTA and Golden Globe award winning actor Olivia Colman. Our next Open Day event will take place on Friday 3rd May 2019. Our next Open Morning will take place on Monday 6th May 2019. Our next Open Morning will take place on Saturday 4th May 2019. For those unfamiliar with our location in an Area of Outstanding Nature Beauty in north Norfolk, the best advice we can offer is to come and see it for yourselves. We are fortunate to benefit from spacious grounds in the Georgian market town of Holt and are situated just four miles from an award-winning coastline. 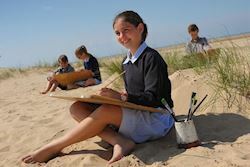 North Norfolk enjoys a diverse landscape from its stunning beaches, picturesque countryside and beautiful market towns and villages; it is a beautiful place to live and learn.